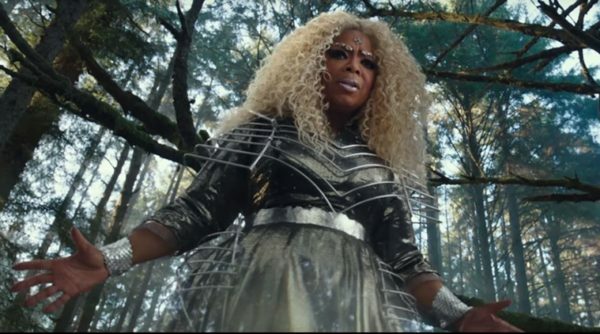 A Wrinkle in Time, 2018. 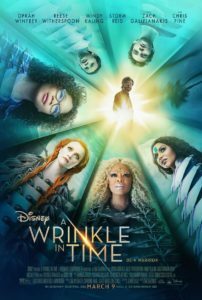 Starring Storm Reid, Oprah Winfrey, Reese Witherspoon, Mindy Kaling, Chris Pine, Gugu Mbatha-Raw, Levi Miller, Deric McCabe, Andre Holland, Rowan Blanchard, Michael Peňa, Zach Galifianakis, and David Oyelowo. 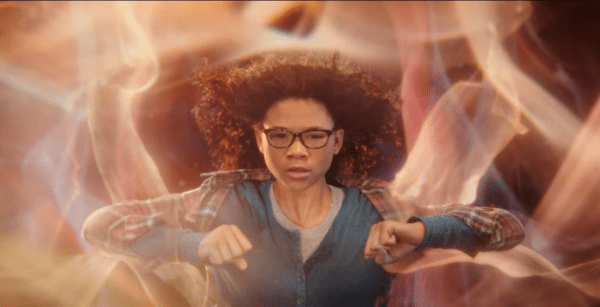 A Wrinkle in Time is a peculiar mess. It aims for the stars, but like a build-your-own-rocket, it flies limply up a few metres before crashing into an unremarkable fire. Director Ava DuVernay, who clearly cares for the source material, has lofty ambitions, yet ambition means little when narrative is at stake. DuVernay, whose previous film was the startling Selma, grapples with sub Alice in Wonderland visuals and deeply personal discussions of growing into your own skin, neither of which stick with any clear cohesion. 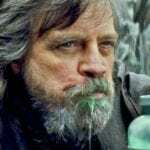 It’s a film yearning for gravitas, something bigger than the self, and achieves only momentarily; the self buried beneath strangely cheap looking CGI and frankly baffling plotting. 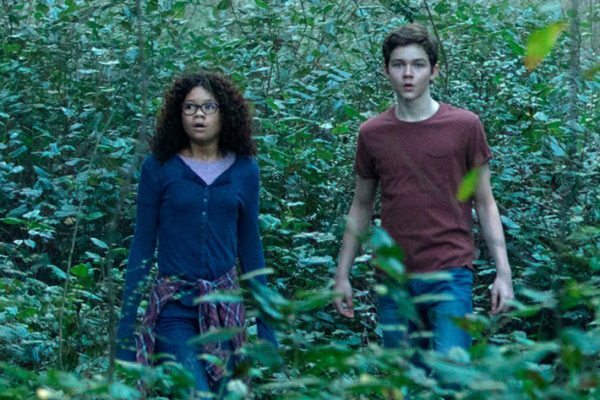 Newcomer Storm Reid is Meg, a budding scientist whose life is thrown off kilter by the sudden disappearance of her father Mr. Murry (Chris Pine), a theoretical physicist working alongside his wife Mrs. Murry Gugu Mbatha Raw in an attempt at travelling through the universe by modulating a frequency that creates a “wrinkle.” Four years after his disappearance amidst a wealth of issues at school, a stranger – Mrs. Whatsit (Reese Witherspoon) turns up out of the blue, suggesting her father is alive. Her younger brother Charles Wallace (Deric McCabe) introduces Meg and friend Calvin (Levi Miller) to Mrs. Who (Mindy Kailing) and then to Mrs. Which (Oprah Winfrey) who transports them to another dimension in order to find their missing father. There’s all too much going on and DuVernay struggles to bring it all together. The “Mrs’” are less characters, more lame tools for exposition. They appear as and when the plot demands with their reasoning for this rescue is never clear. Their aesthetic too looks as if taken straight out of a Claire’s Accessories catalogue. For a film with a budget of $150 million, it all looks shockingly cheap. Oprah – with eyebrows made to look as if made of diamonds – look less like Swarovsky, more like birthday party confetti. Oprah, however regal she maybe, also suffers from misjudged direction. The first time we see her, she’s the literal size of a house and she only grows further (much to the amusement of those in the audience). A moment in which Charles Wallace flies under her and strokes her chin is broadly hilarious. In fact, the least interesting thing about the film is the adventure. It’s all too floaty. Meg, Calvin and Charles Wallace are transported from one place to the next with little care, CGI backdrops are indistinguishable from one another and a final fight sequence is shockingly forgettable. Thankfully, the central relationships are touching and truly investable. Pine – the best of the Chris’ – bares his soul as a man lost in the universe and his love for his daughter is clearly personal to DuVernay. But upon his disappearance, Mbatha Raw is pushed to the side in place of McCabe. Charles Wallace is an insufferable know it all, a ball of trivia answers and irritating cadences. McCabe impresses late on, but hearing characters scream Charles Wallace for two hours is about as annoying as annoying gets. A Wrinkle In Time has it’s moments, it’s a shame these moments are lost beneath $150 million worth of cheap CGI. Remove the Mrs’, remove the masses of indistinguishable CGI, there’s a touching father/daughter story that truly succeeds.